If you have been looking through my projects you know I love to recycle and re purpose. Whenever I go to a thrift store, garage sale, or even find a discarded treasure on the curb, I always look at it in a different way then it’s previous use. I can almost promise you, once you complete an up cycle/re purpose, you will never look at a item the same way again! Always think outside the box . So, here are some re purposed and up cycled items that were once trash, and turned into a treasure. I found this treasure discarded on the side of the curb. You can see it is cracked, broke in half, pump doesn’t work, and filthy. Would you have picked it up? I knew I could do ‘something’ with it! You just don’t overlook something like this….here is what it looks like after the repurpose. I also found these discarded on the curb, would you have picked them up? I may spray paint the legs in a gold, bronze, or silver….haven’t decided yet! I had this bench I wanted to blend into my decor….so I chalk painted it and added glaze. I love the color…it just pops! Love those Giani Countertops! One kit which includes everything! Rollers, sea sponge, sandpaper , paints…everything you need to do your counter tops! Again, Giani White Diamond kit, Homax tub n tile on the sink, painted the cabinets and put new hardware on. Check out more of my re cycles and re purposed treasures! This antique cabinet serves as a handy nightstand with its ample storage, wide counter space and tons of character. Four old soda crates make a combination coffee table and shadow box. The crates were attached to an old table base, then a piece of tempered glass is laid over top. This side table brings together many elements and styles. Retro metal legs were attached to an old library card catalog cabinet, then a mirror was placed on top for a little glamorous flair. An old pachinko game was repurposed into a conversation-piece table. To make the transformation, ornate legs were simply fastened to the bottom of the game. This pair of accent tables was made using rough-cut lumber and old metal chair legs. Design by Joanne Palmisano. There’s almost nothing paint can’t fix. Floral patterns were blocked out over the original wood finish while the whole table was painted white. The results are earthy-looking flowers on a crisp white palette. Old coffee tables are a perfect addition to a front porch. Look for a flea-market special and use a high-gloss, exterior paint that will stand up to the outdoors. An old door finds new life as a coffee table. The rustic finish is perfect for a family room — you can put your feet up, spill soda on it, not use your coaster – it doesn’t matter – it’ll all add to the natural, rich patina. You’ve seen front doors used for so many projects like headboards and tables. Old metal typewriter tables can often be found at flea markets and antique shops. These sturdy structures are a perfect height for a bedside table. Weathered timbers make a solid table and can go with many styles – rustic, old world, contemporary, eclectic and more. The angle cuts on the legs of this table give it an Asian flair. A little pink paint helps turn an industrial wire spindle into a combination coffee table and book rack. Two old crates stacked on an industrial cart make a portable shelf. The hinged openings make it easy to hide away clutter. Did I inspire you? Hope so!!! If you have a before and after project…I would love to see it…as other would….come on…inspire us! Love your trash to treasure crafts! Goes to show..don’t be so quick to pass up ‘finds’. Thank you Robin! Waoo..all the things looks so beautiful…no one can say that the materials were used before. 😄 It’s good to recycle all used up things or waste materials. Sounds awesome!!! Do you find stuff left on the curb too?? Amazing whats left for the landfills, especially when a little ‘love’ is all it needs~☺️❤️️ Hope your day is a beauty! I made the mistake, I’m sorry. 🙁The same nurse signed your moms, and siblings certificate! Wow, that nurse has been around awhile. I hope you have a great day! Such great ideas Kelly, love the fountain. ☺️❤️️Thank you so very much! I can’t believe the great stuff that people throw away. Usually some elbow grease cleaning and a can of paint, is all it needs!☺️❤️️ What is that they say” one mans trash, is another ones treasure! Very cool! I love the show “Flea Market Flip” (can see some seasons on Hulu) because it’s all about taking old things and making them new! I love it too!!! They find so many cool stuff. Wish I had a flea market around here! Love that fountain and since our birdbath is only breeding mosquitos I’m going to go for it! Awesome Pam! Please…I would love to see a picture when your done! 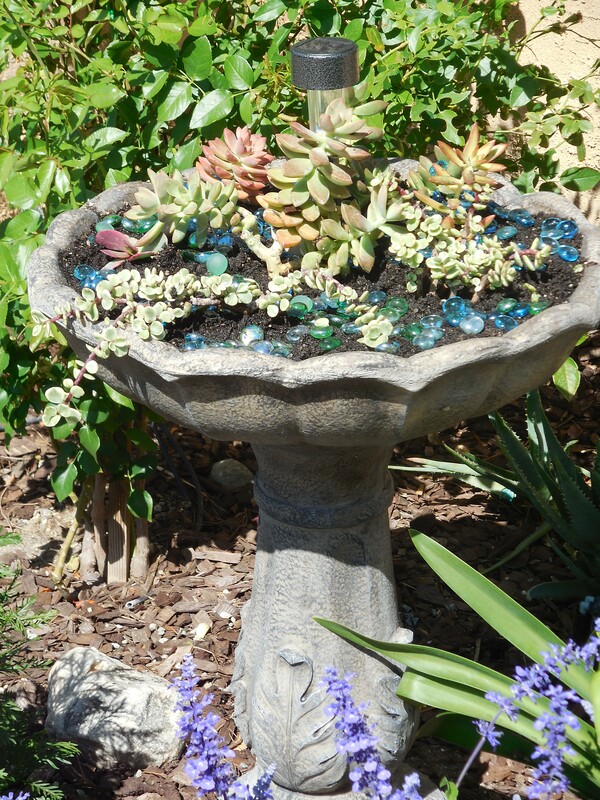 I did the exact same thing with our broken fountain at the end of last season, I could only find one cactus like plant as it was August, it started to multiply by October and I cant wait to see how it does this year. Want to add a few more different ones and a solar light as well! You can get those $1 solar lights at dollar store. That’s what I did! Oh that’s great! Your in Canada? GREAT IDEAS!!!! I’m nominating you for the Mystery Blogger Award! If you don’t want to do an award post that is okay! Have a SUPER DAY!!!! Oh my! You have a gift!